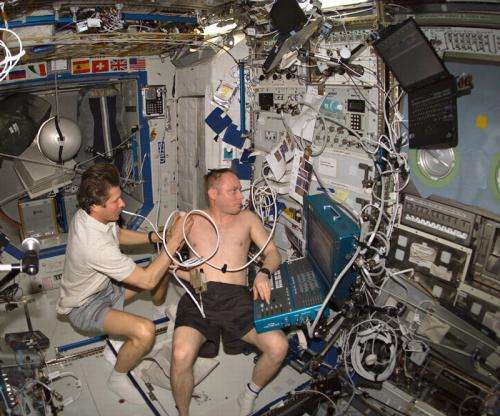 Even though astronauts receive some general medical training in preparation for a stay aboard the ISS, most of them still aren't medical professionals by any means—and with the inherent difficulties of microgravity and the relatively noisy environment inside the Station, even a simple diagnostic task like listening to a heartbeat can be a challenge. 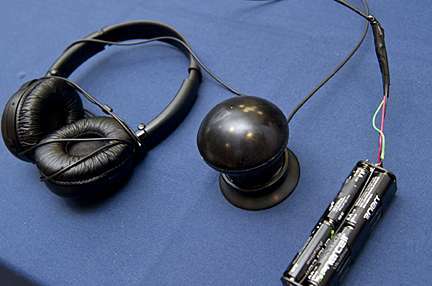 That's why engineering students at Johns Hopkins University have developed a special "out of this world" space stethoscope designed to work well while in orbit… as well as down here on Earth. "Imagine trying to get a clear stethoscope signal in an environment like that, where the ambient noise contaminates the faint heart signal. That is the problem we set out to solve," said Elyse Edwards, a senior from Issaquah, Wash., who teamed up on the project with fellow seniors Noah Dennis, a senior from New York City, and Shin Shin Cheng, from Sibu, Sarawak, Malaysia. Together, they developed a stethoscope that uses both electronic and mechanical strategies to help the device's internal microphone pick up sounds that are clear and discernible – even in the noisy spacecraft, and even when the device is not placed perfectly correctly on the astronaut's body. "Considering that during long space missions, there is a pretty good chance an actual doctor won't be on board, we thought it was important that the stethoscope did its job well, even when an amateur was the one using it," Dennis said. The device also includes many other performance-enhancing improvements, including low power consumption, rechargeable batteries, mechanical exclusion of ambient noise and a suction cup, so that it sticks firmly onto the patient's chest, says Cheng. Though developed for NASA's use in outer space, this improved stethoscope could also be put to use here on Earth in combat situations, where ambient noise is abundant, and in developing countries, where medical care conditions are a bit more primitive. West also plans to use the device to record infants' heart and lung sounds in developing countries as part of a project that will attempt to develop a stethoscope that knows how to identify the typical wheezing and crackling breath sounds associated with common diseases.